When implementing text messaging for the first time as part of your school's communication strategy, the following approaches should be considered before requesting to enable the text option in your notification system. By using this approach, you assume that any phone numbers labeled as “cell phone” in the school's Student System… should just be considered capable of receiving text messages. If this approach is chosen, parents should be notified ahead of implementing any changes, as once the feature is turned on, every parent actively associated to students in the district, will immediately receive a text from SchoolMessenger - see the question (Q:) below for more information on the exact text message they can expect to receive. By using this approach, you only assume that a phone number in the school's Student System is able to receive texts, if and only if the label it’s been given is “Cell – SMS”. If this approach is preferable, the school should provide parents with an opportunity to identify which phone numbers if any on file for them in the school's Student System, should receive texts from the school. This process can be done as part of sending out periodic mailers to parents asking them to verify and change their contact information. As parents identify phone numbers, a registrar then needs to only change the label on the phone number in the student system accordingly to "Cell - SMS", and on the next automatic upload into your parent notification system…that parent will receive a message by text - see the question (Q:) below for more information on the exact text message they can expect to receive. Q: What can individuals expect after their phone number has been identified by your school as able to receive texts? 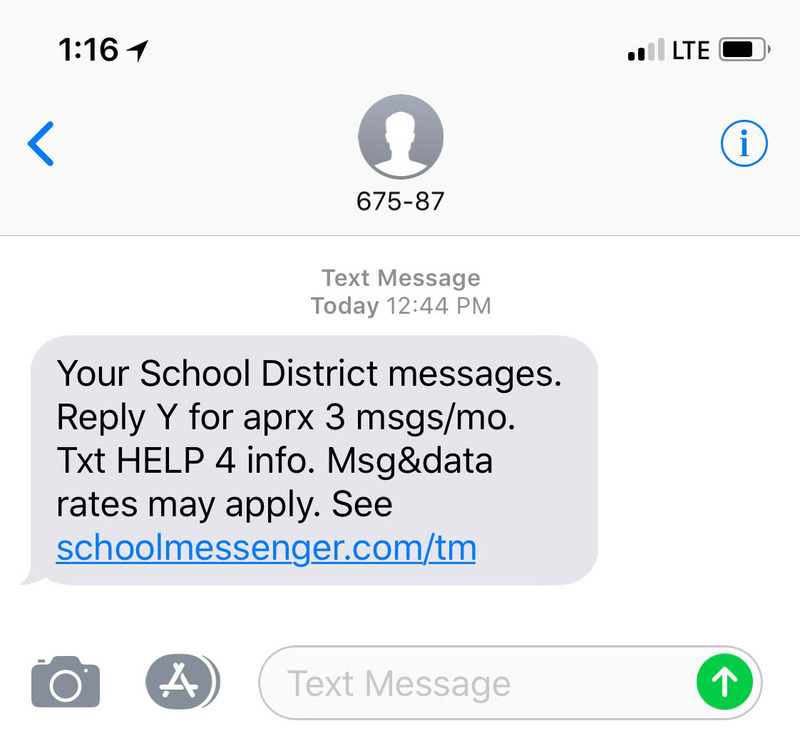 Recipients Of This Text Message MUST Reply To The Message With Either A "Y" Or The Word "Yes", In Order To Receive Future Text Messages From Your School. If they neglect to reply to the above message, their number will NOT receive future text messages from your school. Because of this, it's important that parents know what to do when they receive this initial message from SchoolMessenger, and that they'll even be receiving it to begin with.